BELLEVILLE, NJ USA (March 15, 2018) – VAC-U-MAX proudly announces exhibition at the 2018 International Powder & Bulk Solids Expo that will be held April 24-26 at the Donald E. Stephens Convention Center in Rosemont, IL, Booth 1316 - exhibiting the latest advances in powder-handling process automation solutions and industrial vacuum cleaning systems that maximize plant safety and industrial hygiene. A worldwide leader in bulk material transfer, VAC-U-MAX application experience spans over 64 years, providing engineering and process know-how to the food/pet food, dry-powder dairy, chemical, pharmaceutical, nutraceutical, nonwovens, AM/3D Printing, and petrochemical industries. Equipment and demonstrations on display include a continuous convey and feeder refill system, a large product sampling of VAC-U-MAX’s Signature SeriesTM Vacuum Conveyors, Mobile Conveying Systems, and a full range of NFPA-compliant and ATEX-approved continuous-duty industrial vacuum cleaners for high volume recovery of fine powders and combustible dusts. *Click Here for Complimentary Expo Pass. options that include single or twin jet venturi, regen blower, or vacuum pump. Packaged systems include UL-approved controls in NEMA 4 or 4X enclosure with multifunction controller (MFNC). All packages include unifilter and multifilter designs with static conductive filters. For more information or to Request-a-Quote, visit www.vac-u-max.com/SignatureSeries. 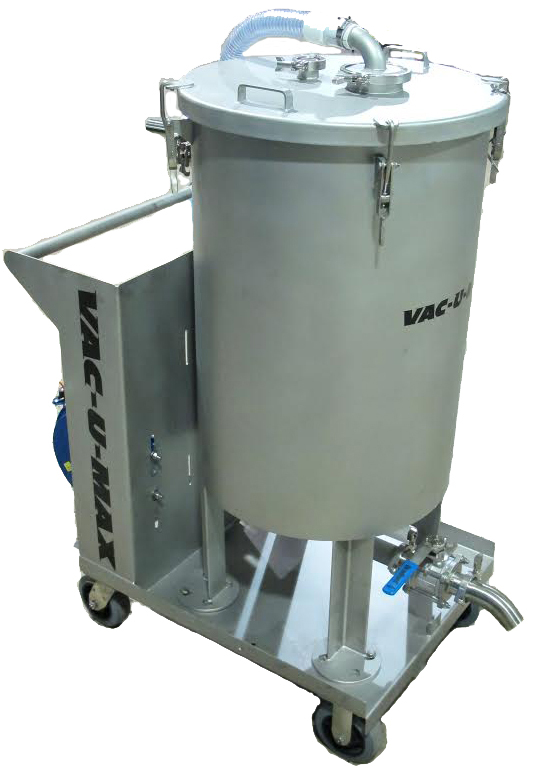 VAC-U-MAX Mobile Vacuum Conveying Systems offer ease-of-mobility for applications requiring access to tanks or other hard-to-reach processing areas. System incorporates an adjustable suction wand where operator introduces product to the vacuum system. Mobile frame incorporates the vacuum producer, conveying product up to 5,000 pounds (2,268 kg) per hour and beyond. Vacuum receiver is manually hoisted for easy up-and-down mobility, to a height of at least 91” (231 cm) at the discharge point, or down to operator level for easy disassembly, cleaning and transport. Vacuum receiver includes replaceable inlet assemblies, easy access to filters, pulse filter cleaning, and full opening discharge valves. Vacuum power source includes air-powered venturi system, regenerative blower package, or positive displacement vacuum pump. Control panel is mounted on the rolling frame and handles the convey, discharge and filter cleaning functions of the system. All Mobile Vacuum Conveying System are USDA-accepted in stainless steel, and available in carbon steel. All receivers meet the rigid requirements of the food and pharm industries. Stop by booth 1316 for a demonstration. The MDL15 is designed with a VAC-U-MAX venturi power unit, proven to have the lowest compressed-air consumption in its product class. 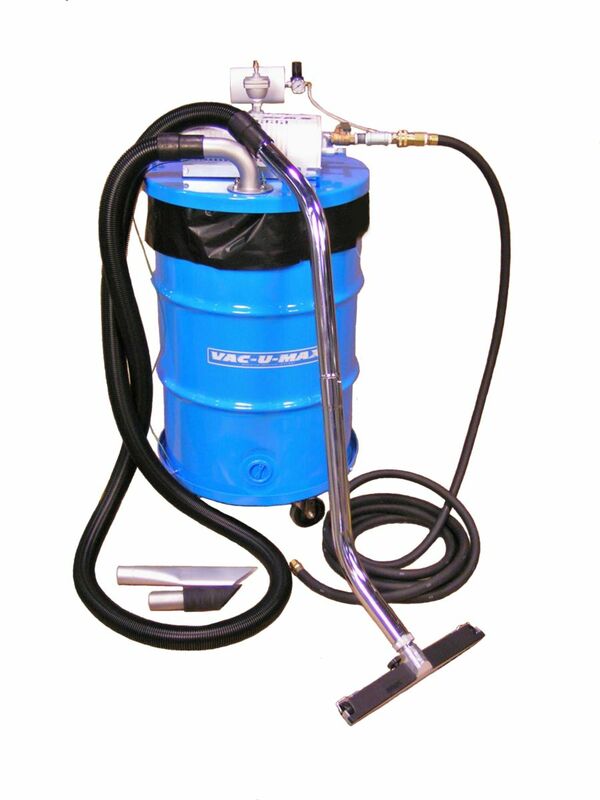 The MDL15 fills a niche between VAC-U-MAX’s 5-gallon hand-held vacuum and the 30-gallon model for combustible dusts, featuring a static-conductive PTFE primary filter and secondary cartridge filter. Unit collects powders and dusty debris in off-the-shelf static-conductive polybags eliminating the mushroom cloud associated with drum dumping. Standard construction is 304SS / 316SS with bead-blast finish, with unit suitable for food environments. MDL15 is ATEX-approved and equipped with static-conductive compressed air hose, casters, ATEX-certified vacuum hose and complete cleaning tool kit. Visit www.vac-u-max.com/MDL15 for more information. 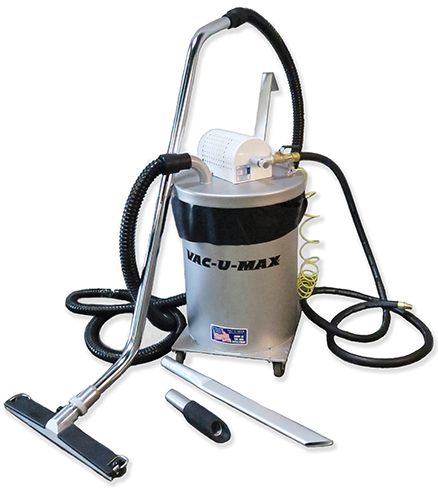 VAC-U-MAX MDL40012 Industrial Vacuum Cleaner features a pulse-jet filter cleaning system for Class II, Division 2 environments. The 55-gallon carbon steel, air-powered unit is ATEX-Approved and completely grounded and bonded, meeting NFPA 77 requirements. Units are available in single (30 gallon & 55 gallon) and twin venturi (55 gallon only). Other models include MDL40013 with 55-gallon capacity, and MDL40008 with 30-gallon capacity. All units are ATWX-approved and ideal for fine powders and combustible dusts. 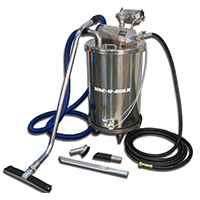 VAC-U-MAX’s newest explosion-proof electric-powered industrial vacuum cleaner that does not require compressed-air, and the only electric powered explosion-proof system available in 55-gallon capacity. Unit runs on 110V with 1hp motor and features a manual filter shaker with all parts designed in anti-sparking stainless steel per NFPA requirements. The MDL55E-XP also features a vacuum equalizer kit that allows the use of off the shelf static conductive collection bags. System is ideal for all combustible dust cleaning applications including grain elevator and agricultural packaging applications. 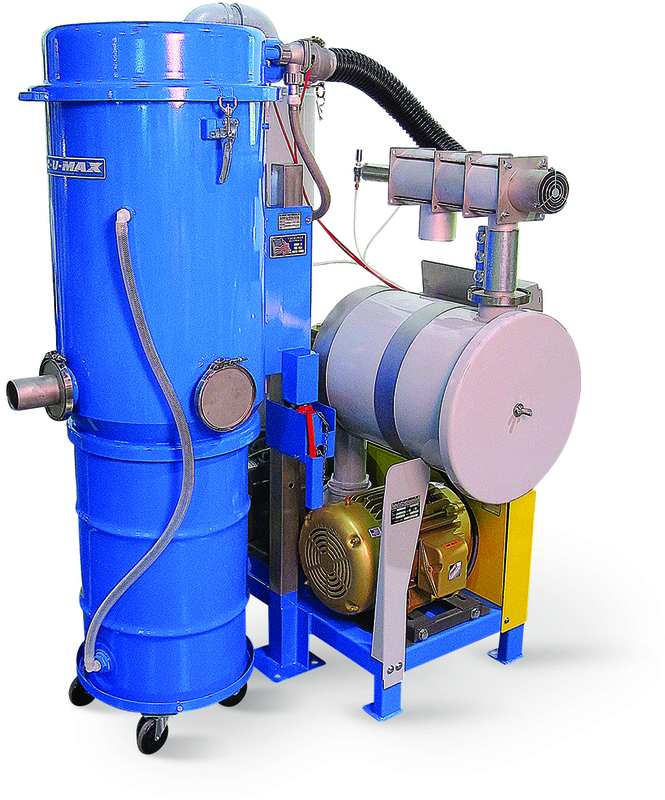 The MDL55SR Submerged Recovery Industrial Vacuum cleaning system is designed to handle explosive powders and render them inert by drawing them under a level of fluid. System features a mobile cart with 6” static conductive casters and dispersion screen that insures the combustible dust is wetted. System designed in anti-sparking stainless steel and features a 2” sanitary stainless-steel drain valve, with disassembly in minutes without tools. The MDL1020 features a powerful positive displacement pump designed for high volume recovery (up to 5 tons per hour), with continuous-duty vacuum production easily meeting even the toughest recovery challenges. Vacuum is very powerful yet portable, making it a versatile tool that can be used anywhere. Large rubber tires and dual swivel castor make the 1020 easily maneuvered by a single operator. Noise levels are below OSHA standard. 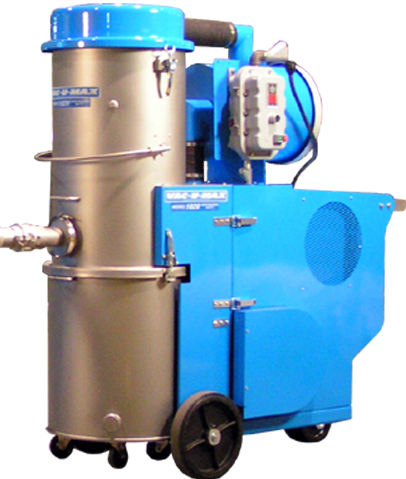 VAC-U-MAX MDL1040PD offers a compact central industrial vacuum cleaning system engineered for 100% more suction power with design optimized for indoor installation. System supports use by up to 3 operators at one time. Flexible design offers longer vacuuming times and filter life. Unit is available in 10HP or 15HP and features a quiet positive displacement pump with automatic off-line pulse filter cleaning and HEPA filtration. The plug-and-play design offers full UL-Certified control panel. 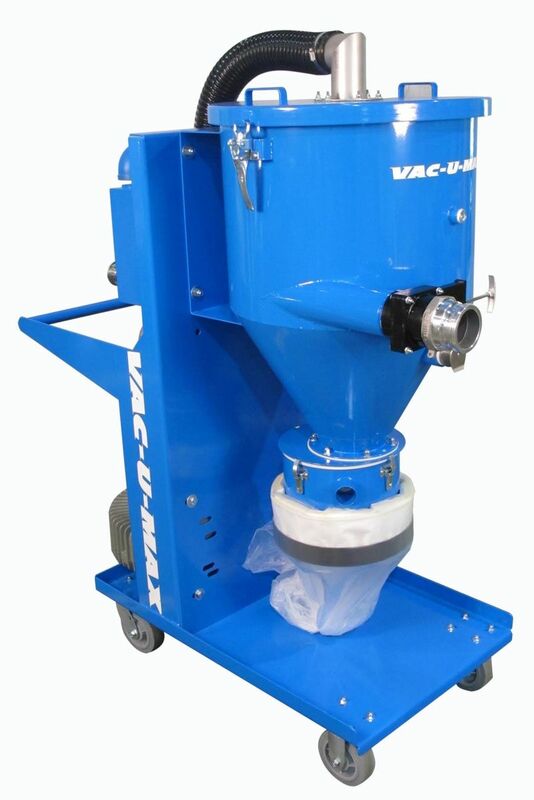 About VAC-U-MAX: VAC-U-MAX is a worldwide leader in the design and manufacture of pneumatic conveying components and fully automated process automation systems for conveying, batching, and weighing powders and bulk materials in the food, pharmaceutical, chemical and petrochemical industries. 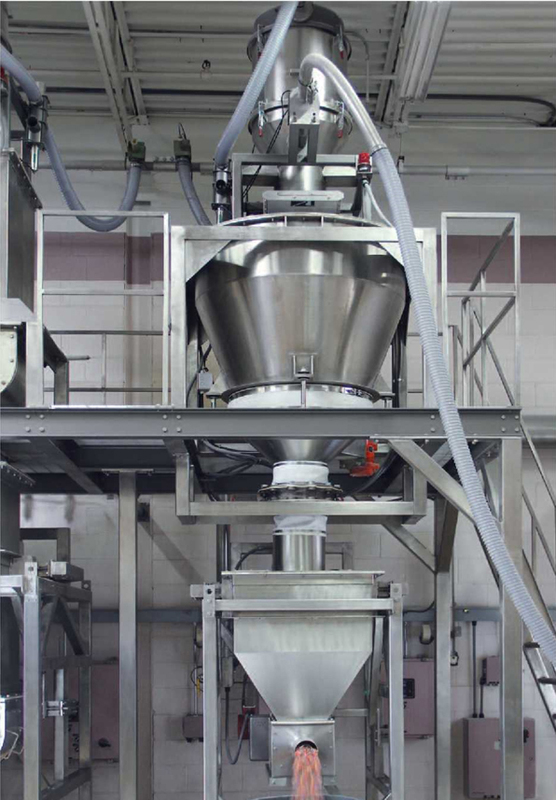 The primary technology for conveying is vacuum, however VAC-U-MAX also specializes in positive pressure systems as well as flexible screw and aero-mechanical conveying. Product range also includes a full line of explosion-proof portable and central industrial vacuum cleaning systems for high volume recovery of various bulk materials, dusty powders, liquids, sludge, and combustible dusts. For more information visit www.vac-u-max.com or email info@vac-u-max.com.